Scary-Crayon reviews... a Pony Tails Collection pony!!! In addition to my newfound attraction to the Hasbro toys, I've developed an interest in the various me-too ponies from other companies. Sure, they're not official MLP toys -- and as such don't have the media tie-ins and established characters -- but many of them are just as cute as their more established counterparts. Many are also oversized horrific monster ponies, likely because they take their design cues (and possibly their actual sculpts; I'm not familiar enough with MLP to recognize bona fide bootleg ponies) from earlier MLP generations rather than the smaller and more animated style of the ponies attached to the "Friendship Is Magic" cartoon. The Pony Tails Collection offerings from Lanard Toys, though -- you'll remember Lanard as the company responsible for that most enduring me-too 3.75" military line, The Corps! 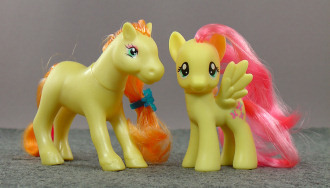 as well as the 6" Dragon-Do martial arts figures -- are among the more attractive of the wannabe ponies. 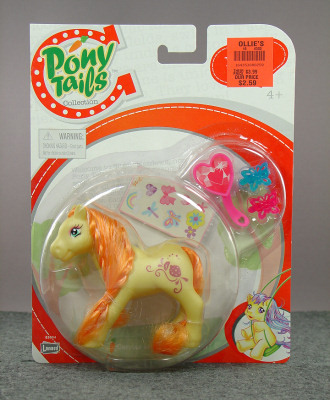 So while I passed on the Pony Tails Collection toys the first time I encountered them at a distant Ollie's Bargain Outlet store, once I got into FIM I knew that I'd have to return for them -- which brings us to today's review! Above, we see the front and back of a packaged Pony Tails Collection figure. The packaging is nowhere near as well designed or compelling as that of an official MLP, but it does the trick and gives one a good glimpse of the other ponies available in the line... assuming they're even actually available as pictured. (I only saw two Pony Tails Collection figures at that Ollie's -- this and a baby pony that isn't among the ponies on the cardback.) There's also a story premise, which we've reproduced for you below! Welcome to Sugar Meadows, home of the Pony Tails®. Come and prance through scented flower fields, swim in a sugary pond, or play all day under a cotton candy sky. These adorable babies are little ponies colored by a rainbow. Each one is unique with a sweet, whimsical nature. They love making new friends and love to have fun! Doesn't that just sound like the sweetest thing ever? I think it does, even if the idea of swimming in a sugary pond is kinda gross -- I mean, you'd be sticky as hell afterwards, and how would you rinse yourself off if all of the water in Sugar Meadows is saturated with the sweet stuff? Ick. Still, they're colored by a rainbow, love making friends and having fun, and probably smell like candy corn instead of reeking of manure like ponies in real life. If I have to choose between Sugar Meadows and the carnival petting zoo, you know where I'll be. Oh, and you can't quite see it in the photos above, but (in addition to the premise, which appears behind the pony in very light grey text) there's also a hidden message just below the pony on the front of the card: "Carrots are Pony's Favorite!" I don't know why they're being so secretive about it, but I do find it rather curious that these ponies prefer carrots despite being surrounded by confectionary treats. Perhaps the message is hidden to keep the same folks who demonize Michelle Obama's health initiative and insist that pizza and french fries count as vegetables from boycotting Lanard for even daring to suggest that a healthy snack should be anyone's favorite. 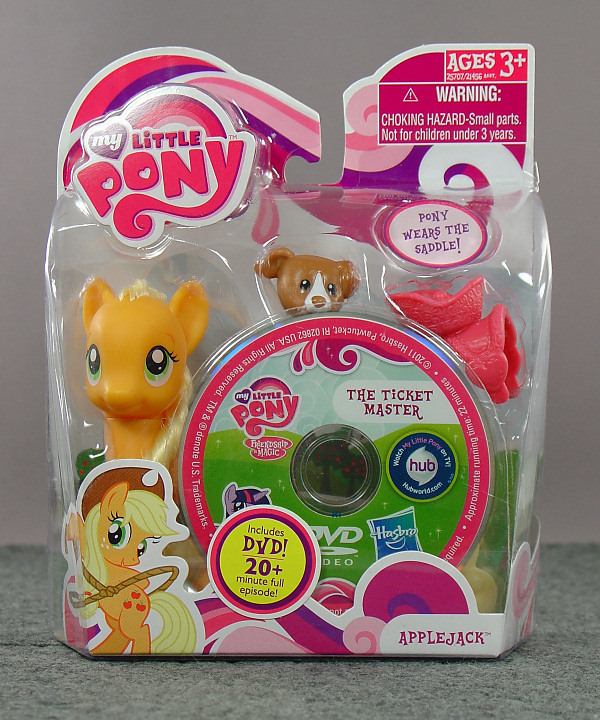 Anyway, here's the pony out of package! I should note that, while getting the toy out of the package was mostly pretty standard stuff, it did have one annoying feature that I've lately encountered on several girly figures -- elastic bands in its hair. Now, these are used to help the toy keep its hairstyle in the package, but often they get tangled up in the hair such that removing them can be a nightmare. That wasn't the case with this pony, thankfully -- I only lost two strands of hair removing these elastic bands, as opposed to the literal handful of hair that came out of Monster High Ghoulia Yelp's head when I removed the band keeping her ponytail set (luckily she had plenty more; even if she hadn't, bald spots on a zombie would have been sort of appropriate). And the pony came with two barrettes, so I just clipped them right over the places the elastic bands were in order to retain the pony's hairstyle. I think I'd have been happier if the barrettes actually came already in place, but then little girls might be discouraged from removing them and placing them wherever they like? I don't know, but it'd be a shame to lose that lovely braid towards the front of the pony's mane. Um... yeah. 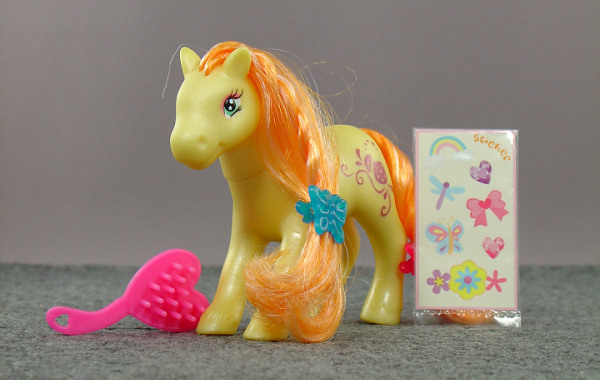 Anyway, the pony comes with the aforementioned two barrettes -- which do the job, though they're made of thin plastic so I wouldn't go bending them back and forth multiple times -- a sticker sheet in case you want to decorate the pony further or your beautify your laptop keyboard, and a hair brush. Pretty standard stuff for a pony... or so you'd think, since 3/4 of the MLP toys I've bought so far have not come with hair brushes or combs. 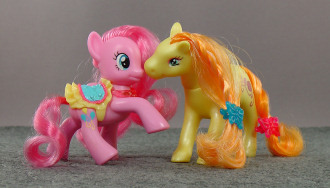 (Take a note, Hasbro: any toy with rooted hair must come with a hair brush or comb.) I haven't actually tried brushing the hair, but good on Lanard for not dropping the ball here. Moving along, more shots of the pony out of package! As far as pony sculpts go, it's pretty attractive -- it's not quite as cartoonish as the FIM (or Generation 4) ponies in terms of proportions, but it's also not so huge or realistic as to be scary or look incredibly out of place next to Hasbro's current figures. In fact, considering the slightly larger and more realistic proportions of some of the ponies in the cartoon, a Pony Tails Collection pony might make a good custom base for a character like Princess Luna if one weren't inclined to do any actual sculpting. 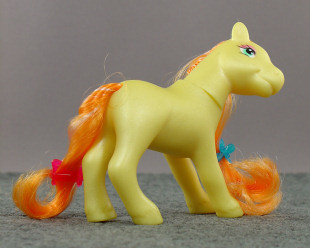 The hair has a fetching orange color with hints of white -- almost like a creamsicle, or carrots with vanilla frosting -- and the body color is a pearlescent yellow that sparkles subtly in the right light, which is arguably preferable to the flat colors of (most of) the FIM ponies. Paint is decent, too. There are a few minor smudges on the body (they look more like dirt than paint, so they might rub off with soap and water), but the eyes are bright and mostly sharp -- aside from the absent bottom lash on the left eye -- and the cutie mark is crisp if a little dull in color. It looks like a strawberry on a vine, so I've taken to calling this pony Strawberry Vine. (Her special talent? Perhaps she's adept at plucking out the eyes of her enemies as if they were fresh strawberries on the vine. And then she uses them to top her carrot cupcakes. She's fiendish.) 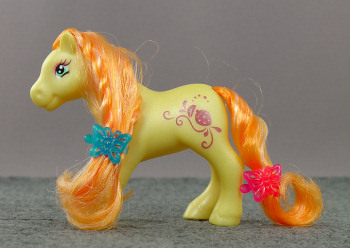 Anyway, Strawberry Vine is a pretty attractive pony, and -- unlike many cheaper me-too offerings -- she doesn't feel cheap, as she's made of a resilient soft plastic rather than the hollow two-piece hard plastic molds of many similar discount ponies. The ponies I occasionally spot at Dollar Tree don't even seem worth a buck, and Hasbro's basic ponies arguably aren't worth $5, but Strawberry Vine definitely feels worthy of her $2.59 asking price. 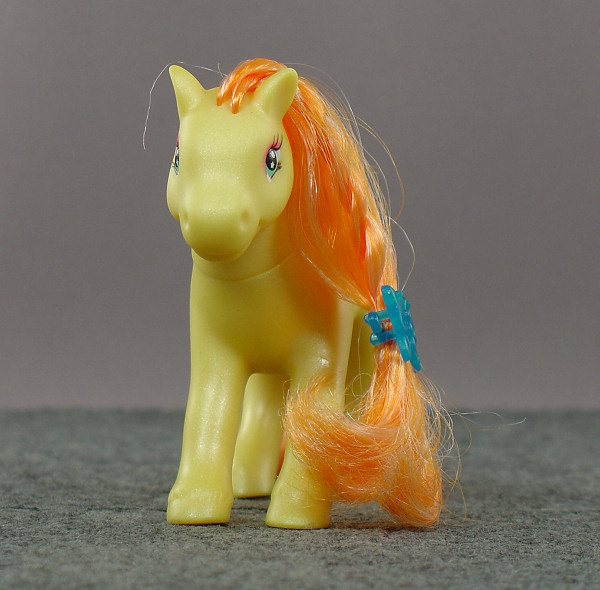 I'd hoped this would be the first of a new, shorter breed of toy reviews... but then I went and wrote nearly 2,000 words about a freaking pony -- and I didn't even have to go on at length about her articulation! (She has one point, a swivel neck. It turns smoothly.) But maybe that's a testament to how much I like Strawberry Vine. Yes, there's nothing special about her in the sense that she's just a pretty pony toy with a decent sculpt brushable hair. But there's nothing really terrifying about her either, and the fact that she's nearly 50% cheaper than Hasbro's offerings doesn't hurt! 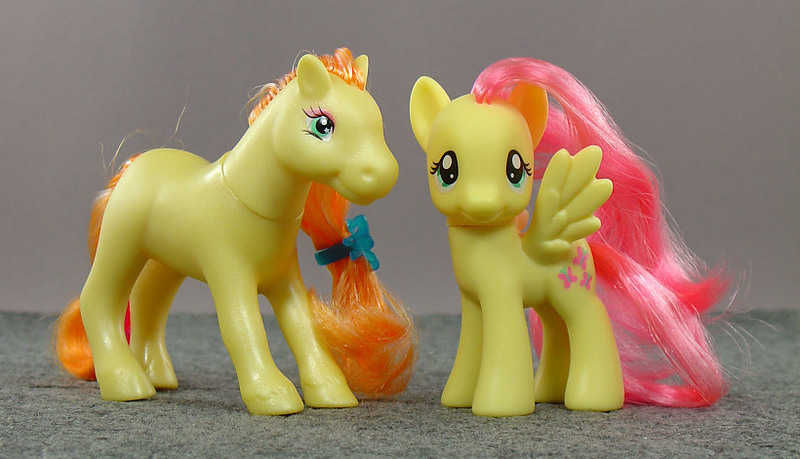 So if you're looking to bolster your pony ranks or have a girl (or boy...) whose collection could use a little variety in the form of a ringer, I definitely recommend picking up Strawberry Vine or another member of Lanard's Pony Tails Collection. 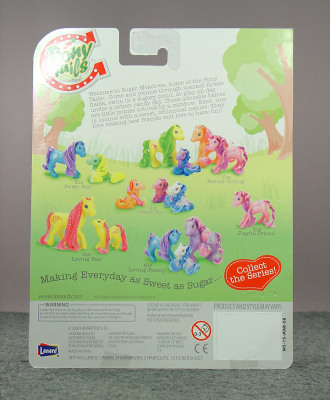 The copyright year on the package is 2008, so I have no idea how easily you'll be able to locate one -- but I imagine a Pony Tails unicorn would be pretty sweet.